Pectoralis major begins on the anterior surface of the thoracic cage and its insertion is to the anterior surface of the upper end of the humerus. Pectoralis major is a muscle which has the function of bringing the arm forward in front of the rib cage which make it possible to make hugs. Bench press can create small tears at the pectoralis major which can sometimes cause a partial rupturing of its tendon (around upper chest). This partial rupture of the tendon occurs in powerful athletes who have gained an abnormally rapid strength, which didn’t allow time for tendons to strengthen. This injury can also happen to athletes who make a « dry » diet, so a low-calories diet to better make muscles more visible. These low-calories diets weaken joints, tendons and muscles. 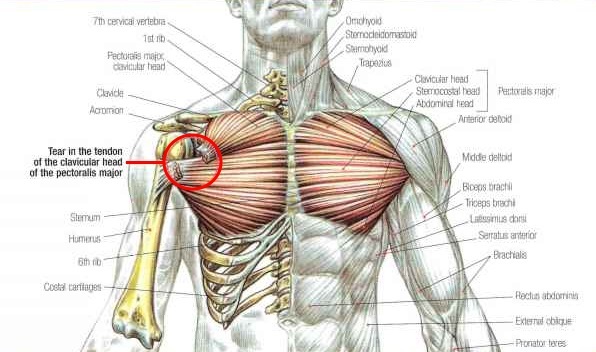 The wound always arrives during a bench press and affects only the clavicular head of pectoralis major. The rupture of the tendon can be so painful that the athlete may lose consciousness. Often a tumefaction with eccymosis apprears on the anterior surface of the arm and the retraction of the clavicular head create a hollow around the upper chest. 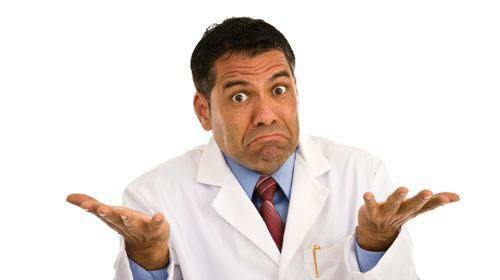 A problem that very often happens with this wound is that doctors, after diagnostic, considers it to be gravity-free. This is an understandable mistake because during the diagnostic, the injured person can make all movements related to the pectoralis major’s motor function. It’s for this reason that doctors consider this wound as a simple muscle tear rather than a ruptured tendon or a severe muscle tear. Indeed, many muscles compensate the functional loss of clavicular head of pectoralis major to continue to move the arm. I spit of the rupture of the clavicular head of pectoralis major, it’s possible to raise the arm forward by the sternal portion (middle chest) and abdominal portion (lower chest) of the pectoralis major which also compensates. When there is rupture of the pectoralis major, it’s necessary to have it reinserted as quickly as possible on the humerus with a surgery operation. If not done as quickly as possible, there is retraction and fibrous transformation of the muscle. In this case, surgery is no longer feasible. It’s true that the injured person can still move his/her arm without the upper portion of the pectoralis major but the injured person can never regain its initial strength and will be seriously handicapped to continue to do heavy bench press.